Home >> Generated from JAN's SOAR Information System on 4/26/2019 4:30:35 AM. Vestil Multi-Person Work Platforms quickly and safely raise maintenance personnel where they are needed. 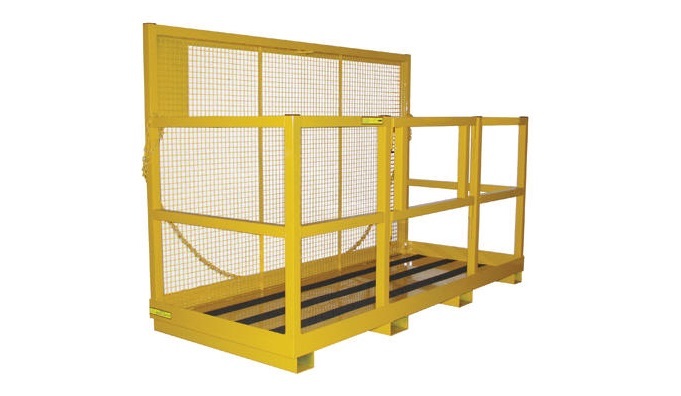 Larger platform accommodates various applications. securing the platform to the truck. Slip-resistant surface and fork pocket openings on the deck. Safety pins behind each fork and heavy duty chains welded to the back frame of the platform that secure around the fork carriage. Built-in pin safety lock on hinged gate. Highly visible safety yellow painted finish.